Normally, I use the email address and my real name for git commits. However, the Github for Windows client defaults to using the Github username for the commit author info. Because of that, I have commits with both names mixed up in the repository now. I know how to rewrite history to fix that, but is there a way to make the client use my real name by default? This issue could be avoided in the future then. As Bob said in his answer, GitHub for Windows will use the name you've configured in Git for the author on the commit. The GitHub for Windows UI allows you to configure both your name and email address via the settings. Click on the "Tools & Options" button and select "Options...". 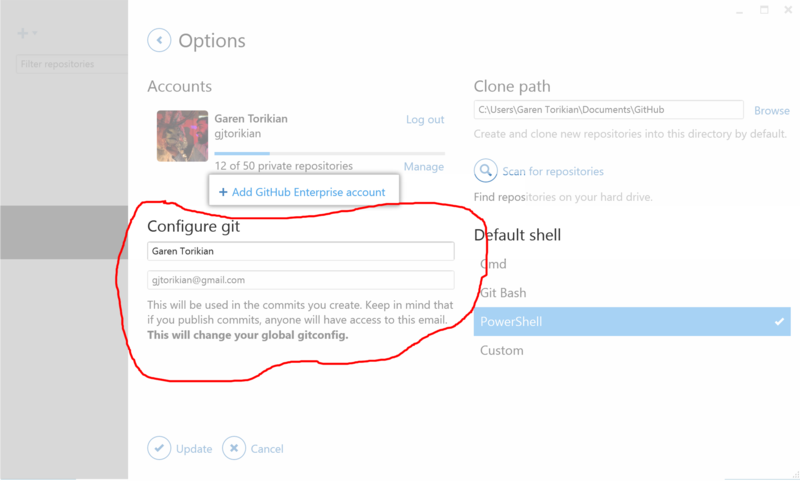 From the options screen, under "Configure git," you can change your name and email address. In fact, that command comes from GitHub's own help docs. Not the answer you're looking for? Browse other questions tagged windows git github commit or ask your own question. Git - GitHub Repository Setup Viable? Rewrite git history to replace all CRLF to LF?